The incredible BABYLON: Babylon, the intellectual and scientific capital, ruled the world. The city of innumerable material and spiritual treasures also boasted magnificent architecture. But despite its reputable invincibility, the city was conquered. It was subdued by CYRUS the Great who, in contrast to the then military practices of the time, decided to preserve this jewel of destruction. CYRUS, as the man who arrived from barren lands and knew nothing of luxury, as the man who only drank water, succumbed to the enchanting city, the memory of which still excites our imagination. The KLEPCYS collection opens the door for you. BABYLON remains in our souls with its glorious hanging gardens which King Nebuchadnezzar had built for his wife, Queen Amytis. Babylon was well known for its mighty seven-storey tower which reached 91 metres in height and was known as the tower " with its top in the heavens ". BABYLON bore the seal of the extraordinary. It has come alive through the watches, the purpose of which is to combine and preserve all of the above-mentioned characteristics. The KLEPCYS collection has brought long-forgotten history back to life. Almost all the intellectuals and scientists of the era are united in this exquisite watch, which is only available in a limited series and whose owner will be its sole guardian. The case design arouses in us the enthusiasm for CYRUS’s men and their emotions as they saw the walls of Babylon in the distance. Mighty, inaccessible, proud, and characteristic among thousands. Only Babylon can resemble BABYLON. The watch sums up this notion with its design and selection of the highest quality materials. An imposing case with a diameter of 48mm (including the crowns) boasts four walls in the shape of horns with high quality finish, and encompasses the main watch mechanism. The slanting lugs for a black crocodile leather band fit the wrist perfectly. The watch with a 18-carat red gold or 18-carat grey gold case combined with Grade 5 titanium with a DLC (Diamond Like Carbon) finish is available only in a limited series. The visible screws remind one of the three-part CYRUS brand logo and represent the " locks " of the walls of BABYLON, which hide uncounted treasures waiting to be discovered. The heart of the city – like the heart of the watch – contains a new and incredible wealth which is certain to amaze you. The mechanism provides three exceptional functions. Imagine time as a line. The retrograde hand moves along the 180° axis and changes colour (while rotating the 180 degrees) depending on the time of day (day or night). Regardless of the hand’s position, the minute and second discs are always aligned and accurate during the linear reading of time. This patented alignment is based on a one-of-a-kind mechanism which controls the speed of the (retrograde and rotating) hour, minute, and second wheels. Now, imagine the date. The units digits (from 0 to 9) rest one on top of the other, while the tens digits change before the units digits. Once the tens digit reaches the figure 9, the figure moves in retrograde and rotates by 90 degrees. It simultaneously opens the space for the next tens digit which is placed before the units digit 0. Another true patented technological discovery. Finally, the tribute to the renowned Tower of Babel, the building " with its top in the heavens ", should be mentioned: a full moon with realistic crater images which links the watch to the sky. The lunar phases are represented by a black patch which gradually covers the full moon. When the moon is fully covered, the three-section CYRUS brand logo becomes visible. Time eventually conquers the waning moon. Three exceptional functions were developed in cooperation with Jean-François Mojon, the renowned developer who received the Best Watchmaker award at the Grand Prix d’Horlogerie in Geneva. The watch face required precise and careful work as well. It mimics the shape of similar triangles. The three angles of the triangles resemble the three parts of the CYRUS brand logo. The logo is identical to the one in the centre of the product, the heart of BABYLON, which, to our amusement, comes alive to the rhythm of passing seconds. The case back of every KLEPCYS collection watch contains an identical copy of a more than 2,500-year-old COIN, fashioned during the reign of CYRUS. Today, the original is owned by the founders of CYRUS in Switzerland. The COIN is a remnant of the first currency in the world; thus, it bears a great historic as well as financial value. All KLEPCYS watches bear the imprint of this very COIN containing the images of a lion and a bull, the indisputable symbols of authority during the reign of CYRUS. 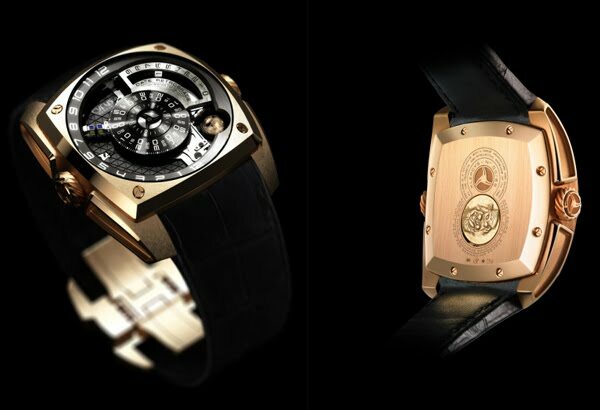 The KLEPCYS collection products also bear a special message directed at the owner, imprinted around the coin: " ... Babylon is a city-state with a unique architecture and gathering all the technical and intellectual Know-How of its time ... " A magnificent city and an outstanding watch are hence conjoined. You will feel incredibly proud when this precious watch adorns your victorious wrist and re-enchants your attitude towards time. Let the message engraved in the back of the watch immortalize this experience: " Proudly made for demanding people. " BABYLON collection products are available in exclusively designed and exquisitely manufactured presentation cases. These are beautiful cases manufactured in the heart of Switzerland in a traditional carpentry shop by carpenters inspired by the very watches. And their contents are luxurious as well. We leave it to you to choose the day when you conquer BABYLON yourself. 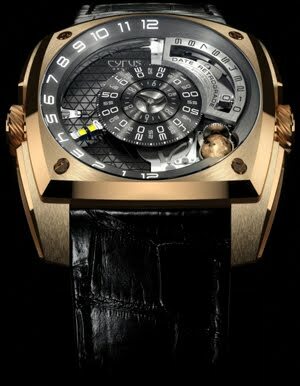 The original coin is the property of CYRUS, and can be viewed at www.cyrus-watches.ch.